The pear shaped diamond is also called the "teardrop diamond" because of it's shape. 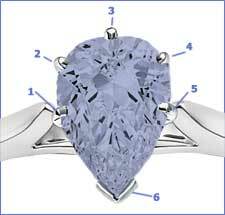 The pear shaped diamond is a combination cut of the round-brilliant and the marquise. The pear shaped diamond is also called the "teardrop diamond" because of its shape. The pear shaped diamond is a combination cut of the round-brilliant and the marquise (to see examples of these two shapes, visit our diamond shapes page. While not the traditional shape selection, Pear Diamonds make lovely engagement rings (either as a solitaire or with accent stones). It's a beautiful cut with lots of sparkle and generally considered to carry a more dramatic flair than the traditional round diamond. The most common question asked about pear shaped diamond rings is "Which way should the diamond point face when wearing the ring?" Meaning "should the point of the teardrop face the wearer's fingernails or wrist?" The best answer? Wear the ring the way you prefer, there is no standard (or even strong tradition) for the "point" direction, and no right or wrong answer. Many wearers feel that wearing the ring pointed toward the fingernails provides a slimming look for the fingers. To give you some ideas of what's available for a Pear Diamond ring, we've preselected a range of certified Pear Diamonds for you to examine (all from James Allen and Blue Nile, two premiere diamond stores). Except for the "Bargain Basement" selections, these diamonds are within our minimum requirements as listed above and are suitable for solitaire settings or settings with accent stones.